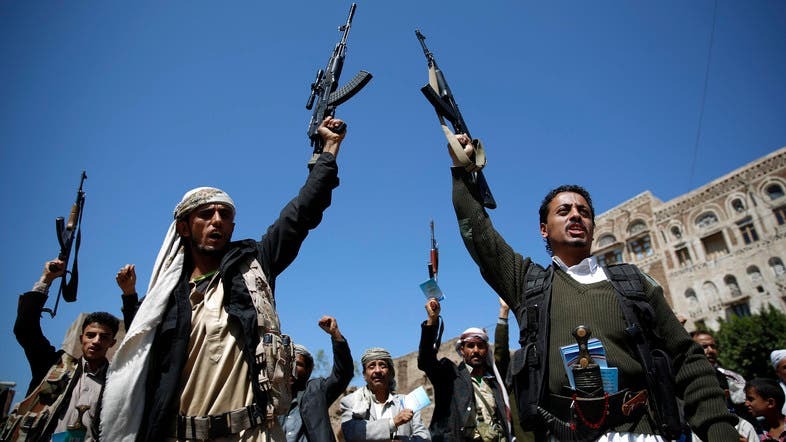 The latest bid on Saturday by Houthi militias and forces allied to ex-president Ali Abdullah Saleh to gain legitimacy by establishing an insurgent-administered supreme political council failed, as members attending the session fell short of the required numbers. The Iran-backed Houthis in alliance with ousted former president Saleh had called the meeting and had announced its intention to set up the council a week ago. Under Yemeni law, a minimum attendance of 151 members of parliament out of the 301 is needed for quorum and to be able to go ahead and vote on procedures or laws that are binding. Those in attendance were significantly lower, with members numbering between 80 and 85, according to Al Arabiya’s correspondent. Despite low attendance, the militias persisted in their attempt to hold the meeting and vote amid the overwhelming presence of armed men. Yasser al-Raeini, the minister of state for the implementation of the Yemeni dialogue process, told Al Arabiya that Saturday’s session would have no legitimacy. effect. Raeini added that Saleh’s move to set up the council amounted to discrediting the legitimacy of the country’s parliament. Sources said that several lawmakers have been desperately trying to escape Sana’a. These representatives had received death threats to coerce them to attend the parliamentary session. In a statement carried on the state news agency Saba, President Abd Rabbo Mansour Hadi who heads Yemen’s internationally recognized government, called the parliament session illegal and warned that MPs attending could be prosecuted as criminals. In a statement released on Friday, UN Special Envoy to Yemen Ismail Ould Cheikh said recurring violations were intolerable and did not aid the peace process. He further reiterated that a comprehensive solution for Yemen could only be achieved by political means.